If you're hunting for a casual yet absolutely chic outfit, rock a G.V.G.V.Flat printed denim shirt with blue skinny jeans. Both pieces are totally comfy and will look fabulous paired together. 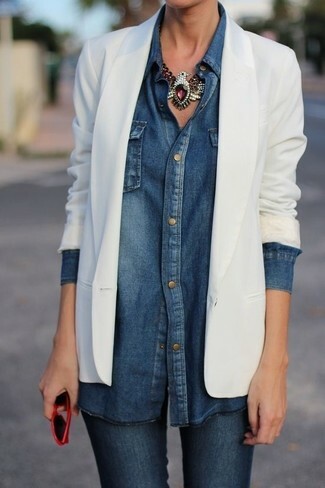 If you're scouting for a casual yet chic outfit, rock a G.V.G.V.Flat printed denim shirt with red skinny pants. Both items are totally comfy and will look fabulous together. For footwear, rock a pair of black leather oxford shoes. If you're scouting for a casual yet absolutely chic look, go for a G.V.G.V.Flat printed denim shirt and blue skinny jeans. Both garments are totally comfy and will look fabulous together. Tan nubuck lace-up flat boots will add a more relaxed feel to your getup. 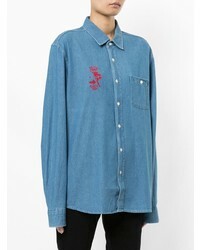 If you're hunting for a casual yet totally chic outfit, wear a G.V.G.V.Flat printed denim shirt with blue flare jeans. Both garments are totally comfy and will look fabulous paired together. Got bored with this getup? Enter beige leather ankle boots to spice things up. 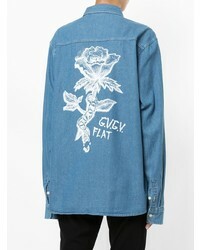 We're all seeking comfort when it comes to dressing up, and this combination of a G.V.G.V.Flat printed denim shirt from farfetch.com and black leggings is a great example of that. Amp up the cool of your outfit by rounding it off with black suede over the knee boots. 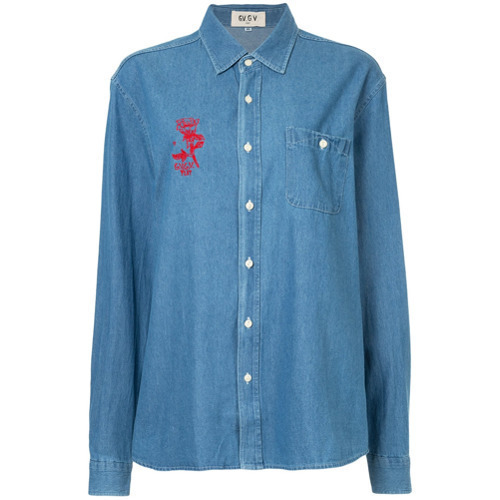 If you're looking for a casual yet totally chic look, pair a G.V.G.V.Flat printed denim shirt with a red full skirt. Both pieces are totally comfy and will look fabulous paired together. Go for a pair of black leather heeled sandals to instantly up the chic factor of any outfit. If you're after a casual yet stylish look, make a G.V.G.V.Flat printed denim shirt and a black lace pencil skirt your outfit choice. Both items are totally comfy and will look fabulous together. 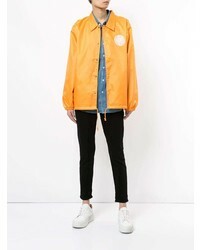 If you're hunting for a casual yet totally stylish look, rock a G.V.G.V.Flat printed denim shirt from farfetch.com with black skinny jeans. Both items are totally comfy and will look fabulous paired together. Dress up your outfit with black ankle boots. If you're in search of a casual yet totally chic look, consider pairing a blue denim shirt with a white crochet playsuit. Both items are totally comfy and will look fabulous together. Brown suede knee high boots complement this ensemble quite well.